Above is an attractive carved high density urethane sign for a ballet (and hiphop) studio for small children. 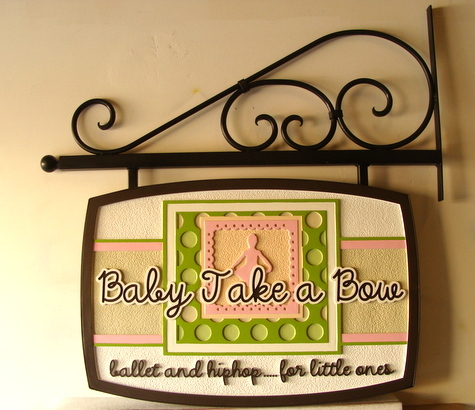 This sign features carved, 2.5D raised (flat relief) lettering, borders and logo (image of little girl dancing). After being painted with long-lasting enamels, clear-coated twice and mounted on a powder-coated wrought iron scroll bracket, the sign is now suitable for indoor or outdoor use.